On its surface, Planet Moon Studios' Battle of the Bands offers an experience that is as unique among its peers as it is hard to imagine. The idea of taking popular songs and re-imagining them in genres they were never meant to played in is an appealing one. Who wouldn't want to hear Tag Team's "Whoomp! There It Is" with a Latin flavor, or Soundgarden's "Spoonman" performed by a marching band? Throw in a musical combat element, involving guns and rocket launchers, and it starts to sound like a real winner. My early hands-on of the game were pretty positive. I wrote "it looks to be a fun, incredibly hilarious diversion from the popular peripheral-based titles," and "I'm pretty sure I'm liking it." Now that I've had some "alone time" with the game, did it live up to my expectations, or do I cry myself to sleep at night because I can't get the hip-hop version of "Man of Constant Sorrow" out of my skull? Read on to find out. 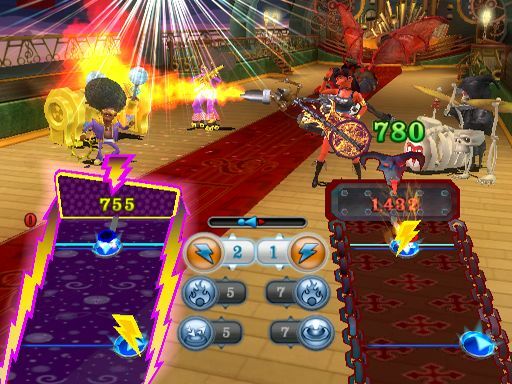 Like Electronic Arts' Boogie, Battle of the Bands attempts to translate your rhythm into Wii remote-based actions. 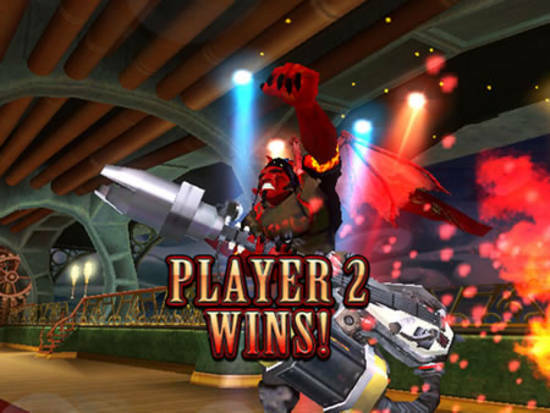 Set up in a similar manner to Guitar Hero or Rock Band, notes scroll up from the bottom of the screen, passing a certain point in time with the music. To hit a beat on the left or right side of the the screen, you make a striking motion to the left or right, respectively; to hit a beat in the middle of the screen (with an arrow pointing down), you'll flick your wrist downwards. Occasionally, a target icon will appear on the screen, which indicates that you must stab at the screen on the beat. Squiggly lines require you to shake the remote, either in a heavy or a light manner, depending on the thickness of the line. For the most part, the Wii remote feels responsive and in time with what is happening on the screen. Most of the beats make sense, but sometimes confusingly jump between following different instruments; one moment you'll be shaking along with the vocal melody, the next you may be waggling to the bass line. It also seems that hitting two of the same notes in quick succession -- left then left, for example -- doesn't always register, or requires panther-like reflexes that I simply don't have. It's easy to place the blame on the Wii remote technology, but why a developer would choose to include a gameplay mechanic that appears to be inconsistent is questionable. The goal of the game is to -- surprise! -- battle other bands. Each successive note hit will charge up one of three attacks (chosen prior to the battle), which you can switch between during battles by pressing the A button, or up and down on the directional pad. 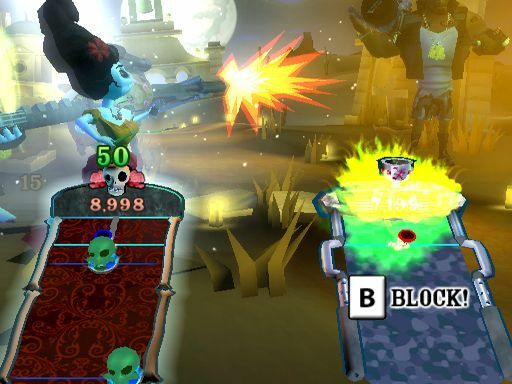 These attacks work in a similar way than those found in the "Boss Battles" in Guitar Hero III, mostly causing havoc on your opponents side of the screen. A huge issue I found with the attacks it that they're somewhat unbalanced, oftentimes giving one player a significantly unfair advantage. For example, the "Flip Out" attack will reverse left and right controls, which is annoying but can easily be adapted to. On the other hand, the "Smoke Screen" attack completely obscures the beat board, making it absolutely impossible to notes without a lot of luck or memorization. Certain attacks can be blocked by pressing B, but some of the more powerful ones -- like the aforementioned "Flip Out" and "Smoke Screen" -- are unavoidable. By successfully landing attacks, the band with the upper hand will begin to perform the given song in their particular genre. For example, Korn's "Coming Undone" can start off in a rock style, and then quickly and seamlessly transition to being played by a marching band. Each song has been re-recorded by professional cover bands to match beats, so that rhythms will match, but the songs will sound dramatically different. The results are sometimes hilarious, but can sometimes be off-putting; certain songs can become unrecognizable when played in another genre, which can make it difficult to land some notes. The cover versions of songs done in opposing genres are all fun to listen to, but some of the remakes of the originals can be painful to hear. If the hip-hop cover of LL Cool J's "Mama Said Knock You Out" doesn't have you cringing, you've either never heard the original or you're dead. The thing about Battle of the Bands is that, despite its simplicity, it's actually pretty fun the first time you pick up the remote and start shaking along with a Country-Western version of Kool & The Gang's "Jungle Boogie." But after about twenty minutes of play, the novelty starts to wear thin, and you're wishing there were a bit more to the game. Listening to the various remixes is a blast, but the gameplay itself becomes tedious, and even worse, begins to wear down your wrist. If you're among the group of people who complained about Wii Tennis elbow or other Wii related medical issues, stay away from Battle of the Bands. The quick flick motions this game requires is hell on the wrist, and the developers were even aware of this fact -- after every few songs, the game will actually remind you that it's probably a good idea to take a break. As a multiplayer game in short bursts among friends, Battle of the Bands is a lot of fun. Passing the remote to another player so they can take a turn forces the breaks that this game requires, but the game's single-player story mode offers no such respite. You start by choosing one of eleven bands, each representing one of the game's five genres. The character designs range from clever and funny to borderline offensive. I got a kick out of the Día de los Muertos-inspired Latin-flavored band Scaryachi, but I couldn't help but facepalm at the hip-hop outfit, Mack Million$. It should also be noted that choosing a band who performs in a genre you like or can appreciate is of utmost importance; I chose country band the Rumbleweeds because I thought it would be hilarious to hear Def Leppard's "Photograph" in that particular style, and it was. But after a few battles, I remembered that country music made me break out in hives, and I had made a horrible mistake. But regardless of what style you choose, you're likely to become tired of the game's repetitive battles and gameplay. I found myself upset each time I unlocked another stage in my journey to face and eventually defeat the evil and mysterious Mr. Hong and his Violent Orchestra. And then when I finally faced and bested him, the game continued, and I realized I was only halfway through the game's tedious single-player experience. I'm not young like I used to be; my wrist can't take this kind of punishment, and my tolerance for repetitive gameplay has dropped significantly. The musical combat and genre hopping madness of Battle of the Bands showed so much promise, it's just disappointing that the gameplay is too shallow to hold up in the long-term. The built-in music player that allows you to listen to any of the game's 30 songs in any genre, on demand, is a definite plus. It's worth the experience to see the game's concept in action, and for most gamers, Battle of the Bands is worth a weekend rental at best.